Take a look at this black-and-white ad we published back in 1977! As part of A-M Systems’ 40th-anniversary celebration, we’re sharing some of the highlights from our archives. This ad was published in the May/June issue of the Medical Electronics & Equipment News in 1977 and was one of the earliest ones we dusted off. 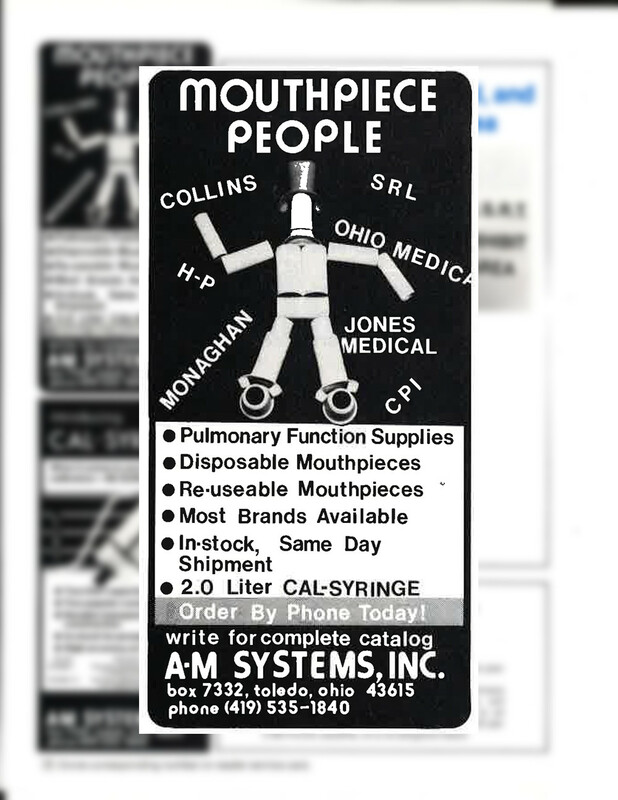 In this ad titled “Mouthpiece People,” paper mouthpieces form a human figurine while rubber mouthpieces stand in for shoes and a top hat. Strewn about the figurine are names of leading spirometer manufacturers, including some that are no longer around. In May 1977, silent film actor Charlie Chaplin was still alive. The Seattle Mariners were reeling from a 7-0 loss a month earlier in its first-ever game against the California Angels. Apple Computer was a month away from selling its first Apple II, and still Commodore was a few months away from releasing its PET 2001 personal transactor. “Order By Phone Today!” was the first call to action in the print ad, reflecting a time before a global network of computers and servers. In fact, researchers in Norway, the U.K., and the U.S. would conduct a three-network Internet Protocol test later that year. And you also had to “write” us to have a catalog mailed to your home or office. While the ad focuses on Mouthpiece People, we were much more than that. And 40 years later, we still offer the latest pulmonary function test supplies, including PFT filters and kits, calibration syringes, and disposable and reusable mouthpieces and turbines. But one aspect of our business hasn’t changed much at all. We keep most of our products in stock and ship them the same day.